First thing most people do when they hear about saltwater tanks is think they are beautiful tanks but cost too much money and time to have one of their own. It is true that it costs more simply because there is a bit more equipment required to setup and maintain a saltwater environment. The price is not a whole lot more, and if you can buy items used or on sale, it really is not a large investment. It also takes little bit more time initially but once the tank is going, just like a freshwater tank, it does not take much to maintain. In this first part, I will go over a rough estimate of the cost and time that will be required to maintain a saltwater tank. Just like in freshwater, the larger the tank, the more it will cost. Also like in freshwater, the more high-tech and advanced the setup the more it will cost. 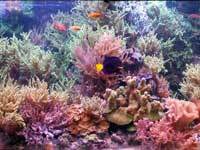 A saltwater tank will cost more than a freshwater tank since there is more equipment involved such as power heads. Same as above except add the cost of 10 - 15 lbs. of live rock from a local lfs. Depending on quality of rock it can vary from $5 - $15 per pound. Setup is different and cost is more, will discuss in greater detail later. A hidden cost for some people who do not have the equipment already in saltwater is a five gallon bucket, small power head, and small heater in which to prepare saltwater in for a water change. A saltwater tank takes just a little extra time than a freshwater tank. Like in freshwater, once a week you need to perform a water change and test water quality. However, in saltwater once you have performed the water change you need to test the salinity of the water also. You also will need to mid-week add a little freshwater (top-off) to replace the evaporated water and keep the salinity at a steady level. You also need to check salinity mid-week. You may spend up to a half hour doing a water change and five minutes mid-week for a top-off. Everyday (like in freshwater) you should check how your fish are doing and check for any problems. In the next issue I will cover in more detail the basic equipment needed in the types of setups and the research required before embarking on your journey into saltwater. My name is Austin or atmachine on the forum. I run cross country and track for my school and also enjoy reading, paintball, and of course keeping fish. I have a 29 US gallon freshwater tank along with a 5.5 US gallon saltwater tank. My fish and inverts that I keep include guppies, angels, bettas, otos, plecos, rasboras, gobie, shrimp, snails, crabs, mushrooms, polyps, and feather dusters.